Someone asked for these nails a little while ago and I thought they'd be fun! 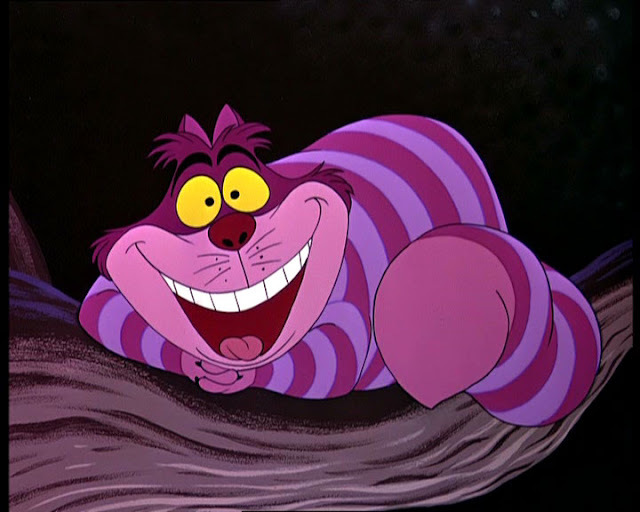 I watched Alice in Wonderland (the old Disney one) many times as a kid and thought the "cat with the big mouth" was pretty cool. Turns out they've been done on nails many times before, too! I saw Robin Moses had done them at some point, but hadn't done a tutorial for them unfortunately. She inspired me to paint the face on a finger instead of my thumb though, and I'm glad I did! The girl who asked for these also asked for a tutorial, but I didn't do that, sorry. It's too complicated to show in a picture tutorial and I wasn't sure it would even work, let alone dare film it for a video tutorial! A simple version of this could just be the stripes and maybe two yellow eyes with a black background on one nail. This is the picture I used as inspiration. For the second time ever, I used acrylic paint for this. I used some black stuff I got from Uncle Bills, it wasn't very high quality and was quite gunky. Still, it was a positive experience, mostly because it meant that the top coat didn't smear the design! I was worried it would ruin the whole thing, so phew! I cut down some of my brushes for this manicure, too. Some of them were left with only a few hairs but it made the finer details possible. As I've mentioned a couple of times lately, I'm a bit wary of my current top coat as it tends to change some of the colours. I ended up using my matte top coat for this instead. I still haven't quite figured it out, though! I always end up with streaks in it that show the glossy part :/. Anyone have any tips for applying it? I try to do as fewer stokes as possible, and I have Color Club's matte-ified. Yesterday was my husband and I's one year wedding anniversary! We had a lovely day together going shopping, out for lunch, dinner and the movies! Normally we wouldn't be able to afford to do all of that, but we just got the bond back from our old house which has been great :). Hope you like these nails! Also, I made all of the pictures on this post extra large - do you think it looks okay? I normally just have them large, but that's significantly smaller. Thanks! No, I'm still terrible at writing my name with my left hand :P. I'm just addicted to nail art and have learnt some tricks along the way. Do I like this? No, I don't I love it!! Great job it looks perfect. Love the Chesire nails! Makes me want to watch the Disney film again. It sounds like your matte top coat is too thick perhaps - polish thinner might correct it? I personally use the Rimmel matte top coat and have no problem with it. Me too! I love Disney movies. I don't think it's too thick, it's been this way the whole time I've had it - but I'll try adding some thinner just in case. I might have to go buy a Rimmel one, thanks for the tip! These are amazing. I can't believe you're so good on your non-dominant hand! Well, I can believe it, it's just awesome. I've got Matte About You from Essie as my matte topcoat and it's pretty good, reliable and doesn't go all weird on me. Might be worth a look! Thanks! I've gotten a lot better in the last month or so at doing my right hand! Okay thanks, I'll have to add it into my next order!